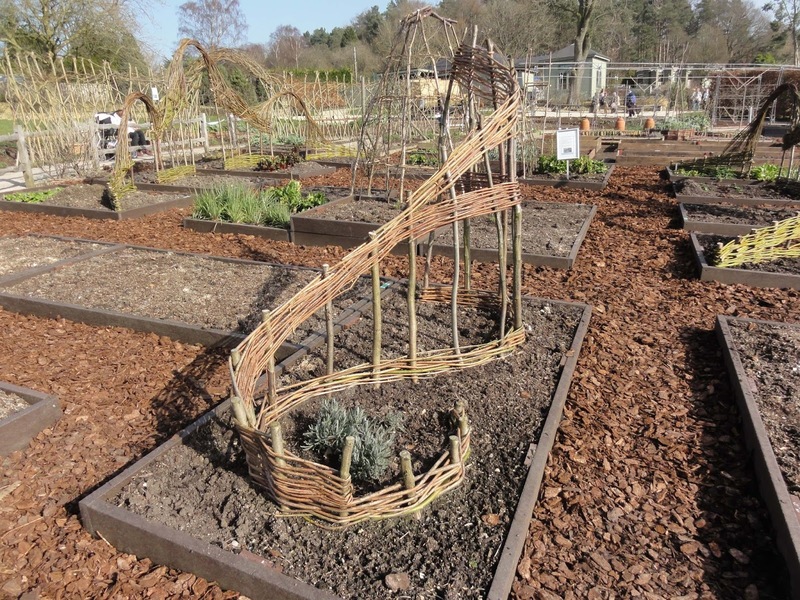 On my recent visit to RHS Harlow Carr, as well as some beautiful alpines and winter flower plantings, they also had a wonderful selection of plant supports in their kitchen garden. Here is a few that I loved for being both attractive and functional. The first is a functional and in my view, not unattractive Asparagus plant support. As anyone who grows asparagus knows, once the cropping part of the season has completed, asparagus then grows into massive ferns. Unless you are growing your asparagus in a very sheltered place, the ferns need some form of staking to stop wind rock and support the large fronds. Usually you don't think about staking your asparagus until after the ferns are large and unwieldy, so I love this practical way of planing for the need for support at the start of the season. The support is tall enough that it is still easy to crop the young asparagus, and strong enough to withstand autumn winds that can knock your asparagus ferns to sometimes horizontal positions. 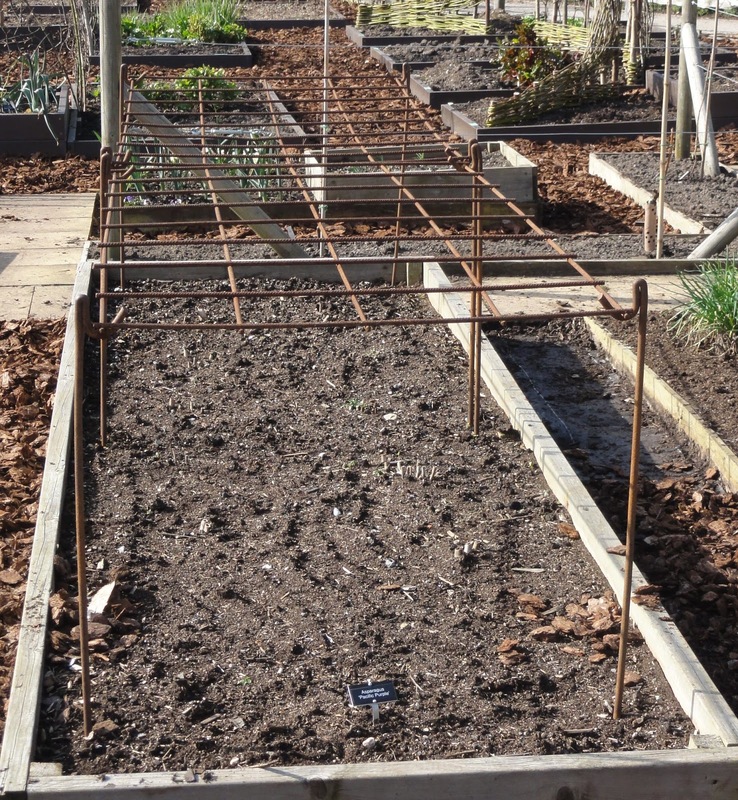 The next support takes advantage of the bed layout and increases the space upon which climbing beans can spread. It looks attractive at the beginning of the season, giving height and interest to what can otherwise be a flat space. And it also makes picking the beans fairly easy once they are cropping, as you can step in very close to the support to get those beans that are hiding away. I could imagine on a hot summers day they would be a nice canopy for a gardener to rest under in between weeding and other tasks. I imagine the following plant support could be used for a variety of crops. At it's lower end, it gives a bit of protection from winds and could create a micro-climate on the inside that protects young plants. As the support grows, taller plants, such as tomatoes, could be tied in, allowing air to flow around them and also making it easy to collect crops. It could also be useful for the taller brassicas, which often need support later in the season in order to stop wind rock. And when nothing is growing on it, it looks pretty. 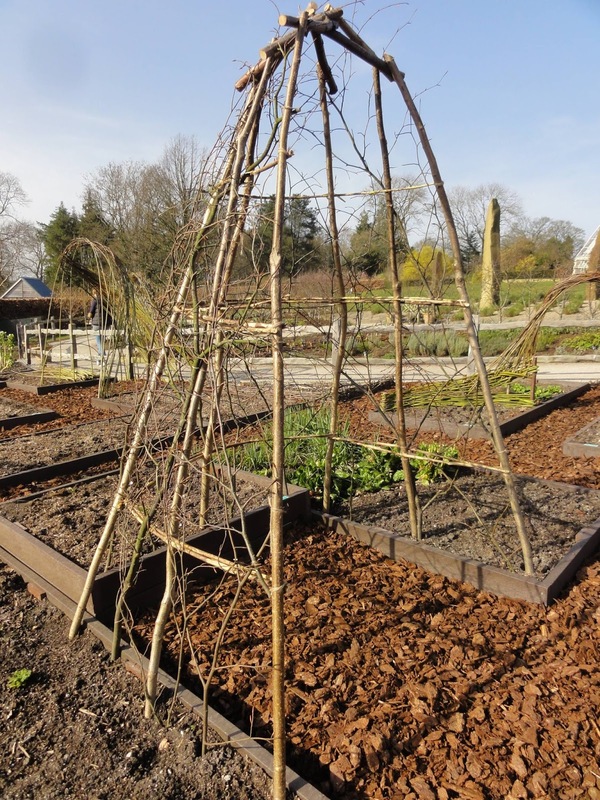 A slight twist on the more traditional way of growing taller peas is next. I could imagine Harlow Carr has to do a lot of pruning of trees and shrubs throughout the year, and it makes sense to take advtantage those off-cuts in the kitchen garden. The 'shrubby' nature of the support gives plenty of space and support for peas as they spread. Finally, I adore this 'fencing' and arch, that again takes advantage of the branches of prunned trees. It is a work of art in its own right, and as plants grow up it and spread, it will both create a wind break and give support. 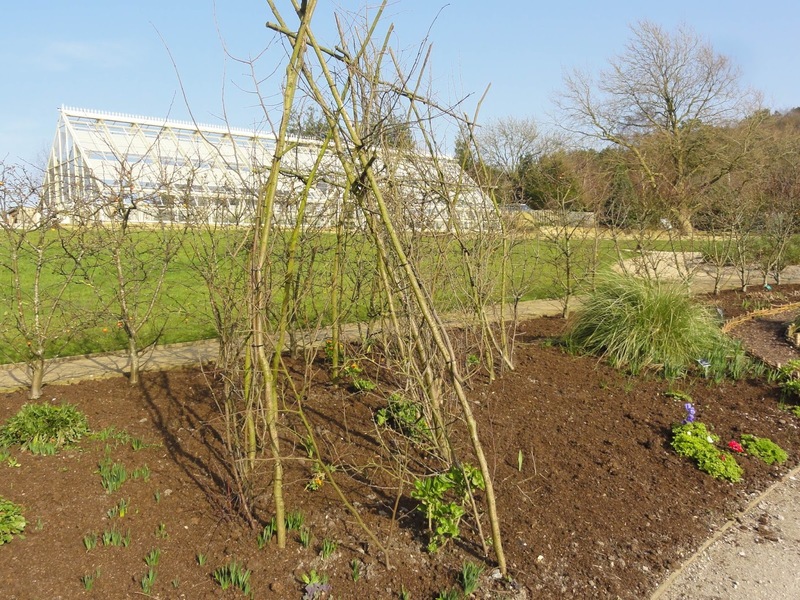 I plan to return to Harlow Carr in Summer and look forward to seeing these plant supports covered in leaves, flowers and crops. But in the meantime, I think they are an attractive addition to the kitchen garden, bringing form and function together with verve, and a bit of fun. You have shown us some amazing ideas here, proving that supports can be beautiful as well as functional. 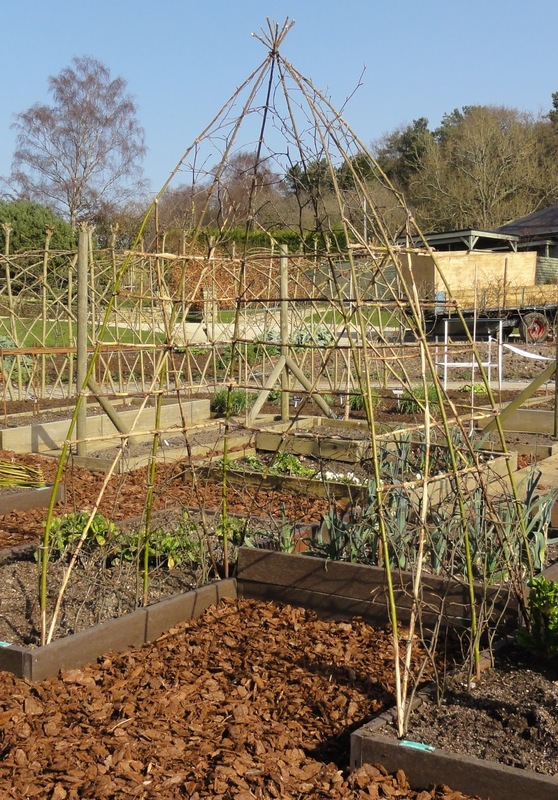 I like the idea of the runner bean archway, freeing up space in the bed for other veg. It's great isn't it. I'm going to attempt something similar, though won't be near as attractive! 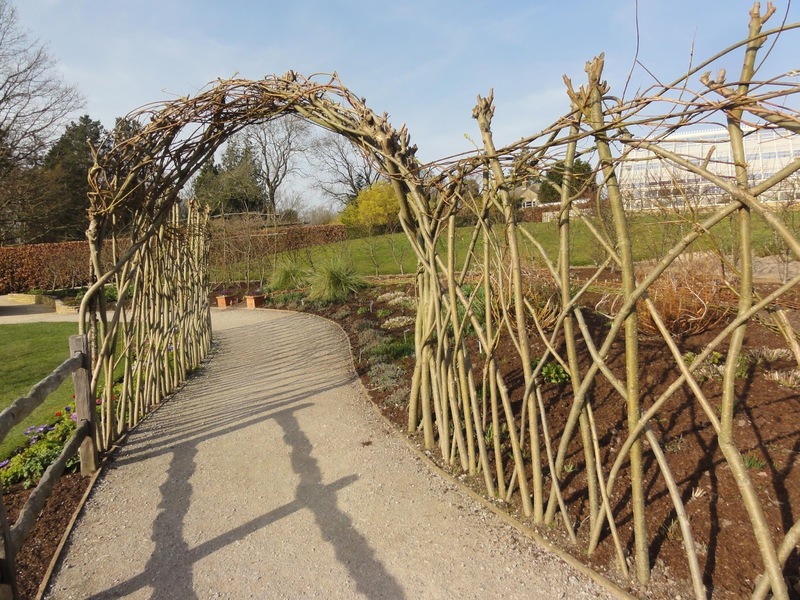 There's some really lovely ideas here, particularly the use of prunings from other plants. 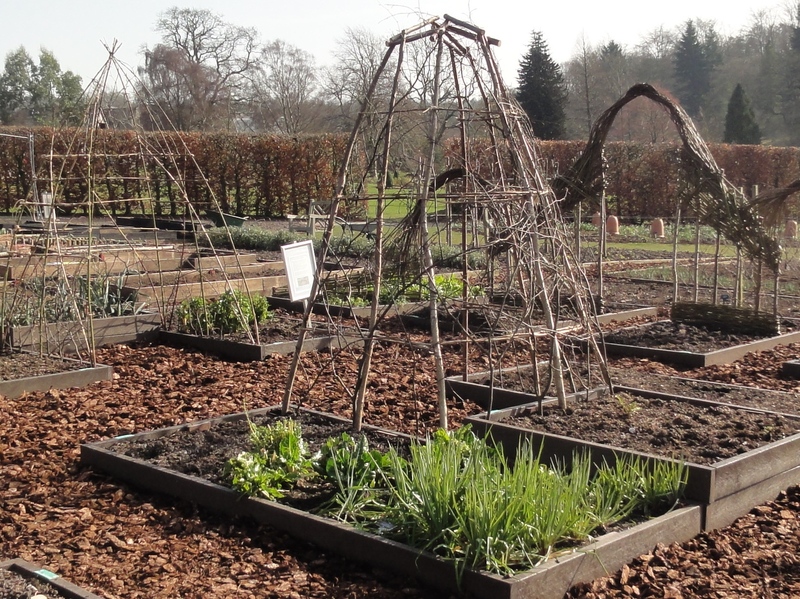 I also love that bean archway, the way it stretches across the space between the beds, and will probably pinch that idea for my veg patch! It's an excellent way to maximise space. Lovely idea to return later in the year and I look forward to reading any posting that you do as a follow up! Some great ideas for supports - I've no patience to create anything like this and had no idea that asparagus got so big. Something new I've learnt today. You've just given me a timely reminder that the peony supports need sorting. Thank you. I suspects it takes some skill & practice to be able to make such amazing plant supports. Asparagus looks amazing in it's fern state - you would never guess that it's the same plant.